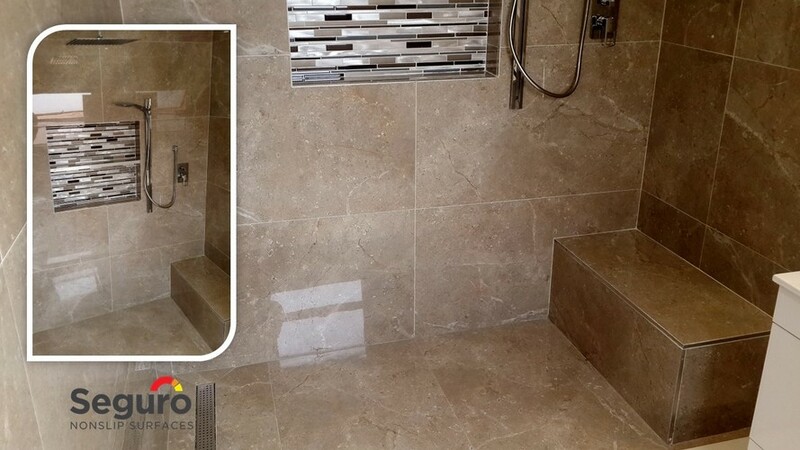 Our client in Bartlett is busy renovating his home and decided on this beautiful porcelain tile for his shower. He knew the tile would be very slippery and dangerous and went looking for the best solution to the problem before putting the tiles down. We tested our anti-slip coating on a sample tile. The results were excellent and our client knew he made the right decision. Choosing our titanium anti-slip coating meant that the tiles in the shower could be made safer without any sacrifice to the luxury design of his new bathroom. The anti-slip coating was successfully applied to the shower tiles and we are glad to have added significant slip-resistance to ensure the surface is much safer to move on when showering.